Welcome to Day #5 of Chocolate, Bourbon and Whiskey Theme Week. 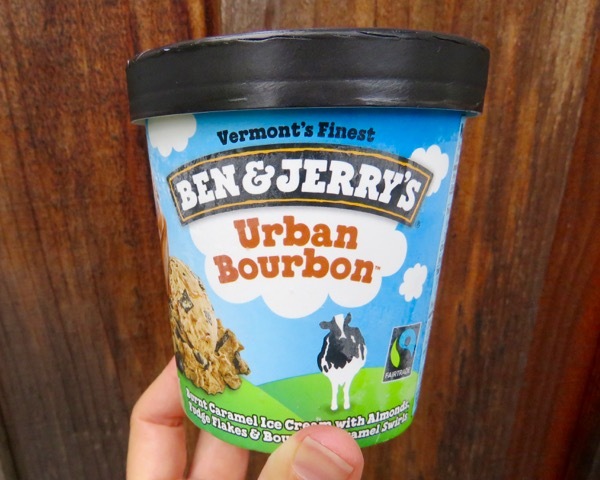 There was a lot going in today's Ben and Jerry's Urban Bourbon Ice Cream. Imagine alternating flashes of toasted caramel, coconut, almonds, chocolate (fudge flakes) and bourbon—all packed into a cold, rich ice cream breakfast. 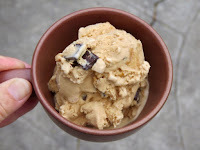 This ice cream contained enough sugar and spirits to fuel a trip into the urban San Francisco and—at 300 calories for a single (1/2 cup) serving—keep hunger at bay until lunchtime. Note to gluten free eaters, this Urban Bourbon ice cream is probably not gluten free. In between the cocoa powder and the guar gum in the ingredients list was dry malt extract (barley).